This Friday just gone I finished work. Our little loaf is due in just over two weeks and I’m finally ready to admit that my forty five minute commute on the tube twice a day is getting a little tiring. Although it’s weird handing over your working life for a year – holiday time! I can hear mothers all around me chuckling – I’m ready to start nesting, preparing our home for this little life to be. The next two weeks will be spent tidying cupboards and sorting last minute decorations, maybe a pedicure for those feet I can no longer reach, long walks with my mum and lunches with friends. People keep saying I should take some quiet time before this little man drops in and changes our lives forever, and I will, but busy is my default setting and just what I enjoy. Which I guess stands me in good stead for the months and years to come. On Saturday one of my loveliest friends threw me a baby shower. Like a hen do, I think these things are often a big surprise, but she knows me well enough to share her plans in advance as I like to be involved in these things (read muscle in). She’d enlisted four of the party to bring baked goods and said I was allowed to make one thing (reining me in was probably a good idea as we ended up with far too much food even after a dozen girls had eaten their own body weight in sugar) so I decided on these simple chocolate cupcakes. 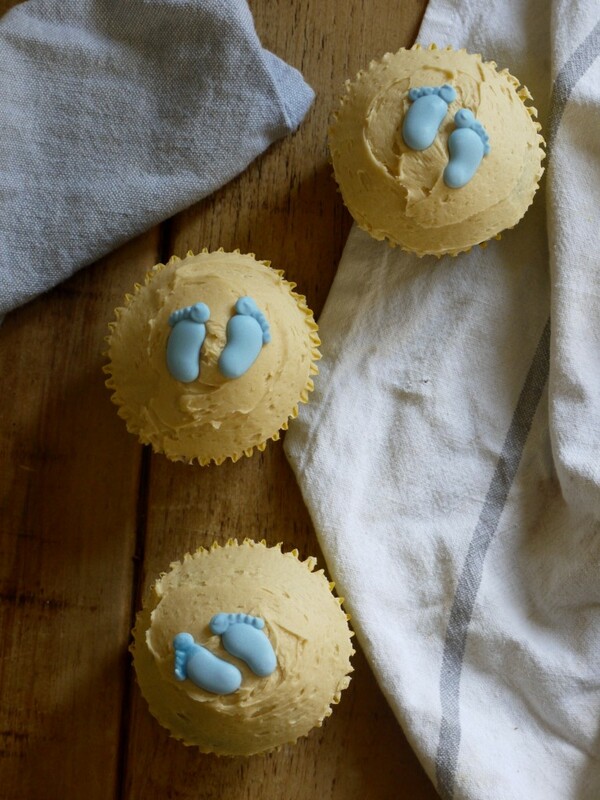 Chocolate cupcakes topped with caramel buttercream and the most adorable sugar paste feet in keeping with the shower’s baby blue theme. We got so many gorgeous gifts – tiny babygrows and blankets, rattles and toys, flowers, a nursing pillow I’m already in love with and some pampering products for me – but what really touched me was having all these people I love in one room. The coming weeks are going to be nothing less than crazy with our baby’s heart condition, being in and out of hospital and this sense of the great unknown, and having the love and support of so many special friends is truly humbling. Some of the greatest gifts don’t come wrapped with a ribbon. 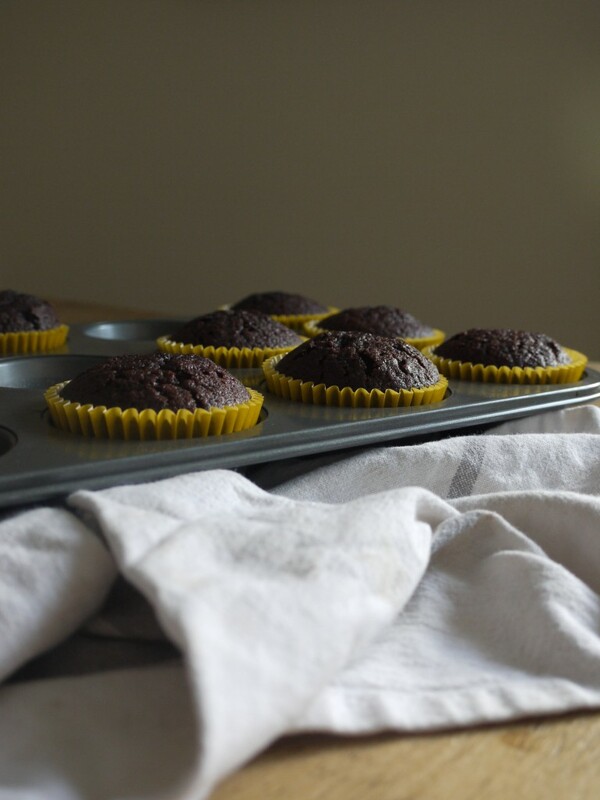 These chocolate cupcakes are a classic rather than anything revolutionary. The basic recipe is taken from Jemma Wilson, founder of Crumbs & Doilies and the queen of all things cupcake. Vegetable oil and buttermilk yield a cake that is rich, moist and deeply chocolaty without being too sweet, which in turn is balanced out by a salty sweet caramel buttercream. I topped half the cakes with these dinky sugar paste feet and half with a blob of buttercream and some chocolate truffles we had left over from Luke’s birthday. Jemma suggests shards of frozen Snickers or a drizzle more salted caramel which would also go down a treat. 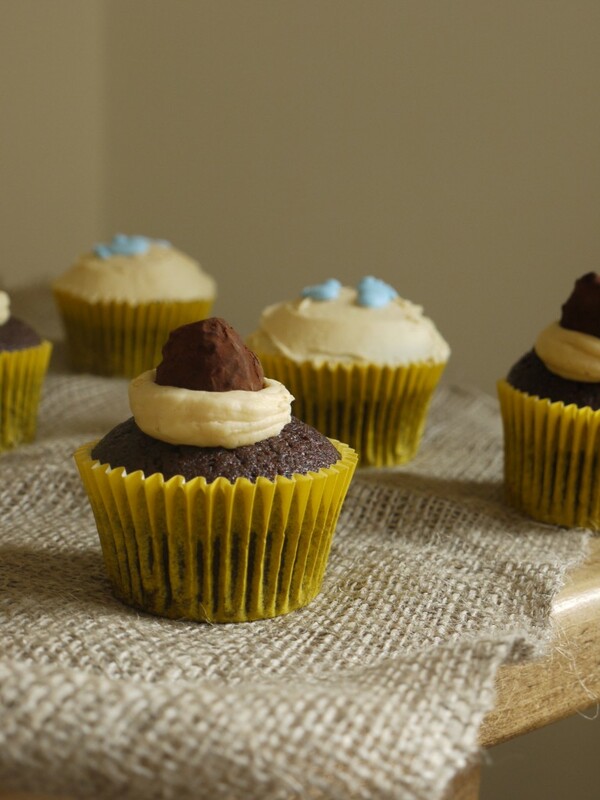 Rich, moist chocolate cupcakes with chocolate chunks and a creamy caramel frosting. This recipe makes 24 cupcakes, so if you don't have a lot of mouths to feed, freeze half (un-iced) for future snacking. Preheat the oven to 170 degrees C/150 C fan and line two 12-hole cupcake tins with cupcake cases. In a large bowl, sift together the flour, cocoa, sugar, bicarbonate of soda and salt. Stir in the chopped chocolate. In a separate bowl, whisk together the eggs, coffee and buttermilk. Pour the dry ingredients into the wet and whisk to combine. 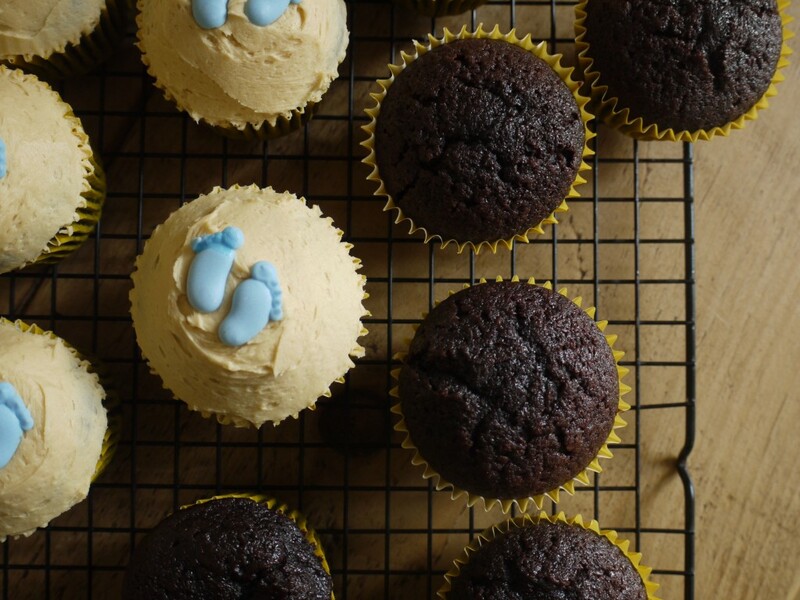 Divide the batter between your cupcake cases - each one should be about two thirds full - and bake for 22 - 25 minutes. Remove from the oven and allow to cool completely. To make the buttercream, beat the butter in a stand mixer fitted with a paddle attachment for 5 minutes, or until really light and fluffy. Slowly add the icing sugar in three batches until you have a smooth buttercream, then beat in the caramel. 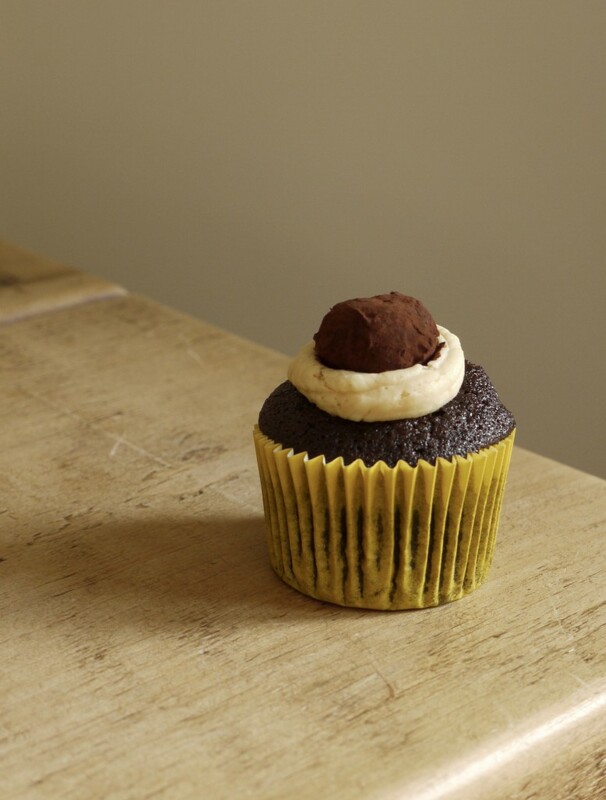 Spread or pipe the icing over the cooled cupcakes and top with miniature feet, truffles or a drizzle more salted caramel. Cupcakes will keep in an airtight container for 2 - 3 days and can be frozen, without the buttercream, for up to one month. 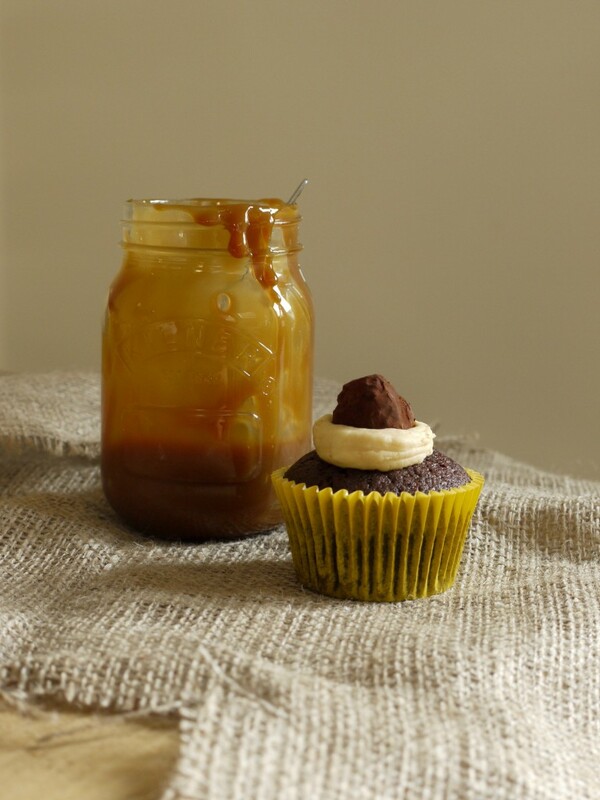 Recipe adapted from Cupcake Jemma's Salted Caramel Chocolate Mudslide Cupcakes. Wishing you the best of luck and happiness with your new baby – you must be so thrilled. What a lovely post. I finished work 3 weeks before my due date and loved those three week, nesting, meeting up with friends, chilling with netflix… Then she was 2 weeks overdue! Those two weeks were pure hell. Enjoy this very special time of your life and you will be in my thoughts in the next few weeks.